1 x Silver Glitter Heart on a Dark Grey background. 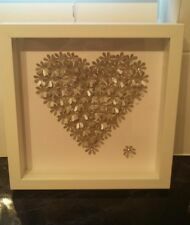 1 x Silver Glitter Heart on a Light Grey background. Hand Painted / Hand Glittered (Glitter is fully sealed and wont rub off). Canvas Wall Art Pictures. If you are an animal lover, this is the perfect ornament for you. This unique designed ornament would add character and charm to any home. 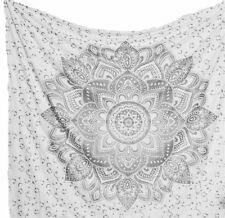 The design of the mandala is to be visually appealing so as to absorb the mind of the observer with spiritual essence which in turn leads to higher awareness. 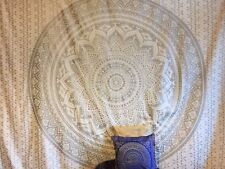 A mandala can be seen as hypnotic, letting the creative hemisphere of our mind run a little more free while our analytical mind takes a little nap. 2 x Silver Glitter Heart on a Dark Grey background. 2 x Silver Glitter Heart on a Light Grey background. Hand Painted / Hand Glittered (Glitter is fully sealed and wont rub off). Canvas Wall Art Pictures. Silver Fish Hanging Wall Art Decoration 29cm Tuna Modern Polished Aluminium New. Beautiful nautical wall decoration by Shoeless Joe. A resin wall hanging diving man figurine. A unique yet stunning piece of art for your home. Angel Wall Hanging. This stunning angel wing made by David Fischhoff is perfect for hanging on your wall. 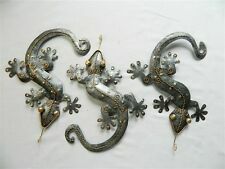 Hand made and painted in Bali they will add a dash of colour to your wall or fence. Each gecko is decorated with gold wire along the body. There is a fixing ring on the back of each gecko to enable you to fix it to the wall or fence. Material, clothing care, size - all will be defined. Our primary desire is to make your clothes fit you. We assure that you will get your desired product at the popular price. We make sure that you get what you buy. Can also be freestanding. hangingflying bird. 7 hand painted fish swim mounted on a driftwood plaque. W 14 x H 7 x D 3cm (not including hanging string). Isle of Wight. Channel Islands. Isle of Man. Held up with a keyhole bracket situated on the back. AB and IV / KW1-KW14 / PA21-PA38 / PA80 / PH16-PH26 / PH30-PH41 / PH49-PH50. The design itself uses circles, of various sizes, to create a large-scale swirling effect. A smattering of circles are also filled in a silver colouring, providing a contrast with the rest of the piece. The legend of the dream catcher is believed to have originated with the Oneida Indians in the United States, the dream catcher allows good dreams to flow through the spirit hole in the centre of the web and bad dreams are trapped in the web and then disappear with the morning sun. Chest of Drawers. Shabby Chic. Shabby Chic Accessories. Colour: Silver. 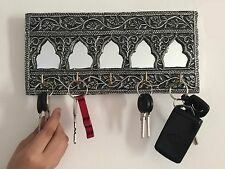 It has a hook on the reverse for wall mounting. Cream Furniture. Ornate Dog Bowl. Wall Clock.